Abstract: The 1.0GHz Duron processor we have in the labs for review is based on a AHLCA K stepping and was made some time in Week 2 of 2002. We've been focusing our attention on the AthlonXP lately but we often forget that most people want something a little less pricy for their home computer; most applications don't even tax a 1 GHz CPU let alone one that runs at 1.5 GHz. One solution to this vexing problem is AMD's budget chip, the Duron 1 GHz. With a price of roughly $90 CDN in the retail package, the Duron 1 GHz CPU is very affordable. Based on the Morgan core (really just Palomino with 64KB L2 cache) the 1 GHz Duron has the same features as its more expensive AthlonXP/AthlonMP brothers. Those features include hardware prefetch, 3D Now! Pro technology and even SSE. The 1.0GHz Duron processor we have in the labs for review is based on a AHLCA K stepping and was made some time in Week 2 of 2002. The AHLCA stepping was originally introduced when the Duron 1.3 GHz CPU came out, so it looks like AMD has been filling the lower speed grades! Anyway here's a bit on the processor. The Duron 1.0GHz processor uses Flip Chip technology like every other AMD chip at this time so the core of the CPU come in direct contact with the heatsink. 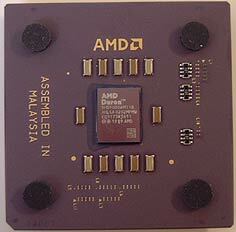 Unlike the AthlonXP, AMD has not moved the Duron to the cheaper and more durable Organic PGA. The Duron still resides on the tough but brittle Ceramic packaging (CPGA). The Morgan core, like the Palomino, has the same number of bridges on the surface of the ceramic packaging. Unlike the AthlonXP however, the Morgan core is using CPGA so it's much easier for overclockers to unlock and manipulate the bridges. A simple pencil is all that is needed! Ahh, the good ole days. Like the Spitfire Duron's, the Morgan core still runs on a 100 MHz DDR/200 MHz SDR bus speed. With no real performance competition from Intel's Celeron, AMD feels little motivation to move the Duron to something faster. Unlike the AthlonXP line of processors, AMD does not use Performance Ratings with the Duron since since the current Celeron (based on the P3) doesn't have a huge clock speed advantage. This clock speed situation will change when Pentium 4 based Celeron's come out later this year. Since the Morgan core is basically the same as the Palomino with less L2 cache the 1 GHz Duron has all the goodies we'd expect from the AthlonXP's! The Morgan has hardware prefetch, a technique which allows the processor to predict what data is needed next for example. Hardware prefetch can be very handy in situations with office based applications as they're easily predictable programs. Like the AthlonXP, the Morgan based Duron also has Intel's SSE technology built into the core. SSE when used properly is quite a bit faster then the FPU of the processor. Unlike earlier Duron's and Athlon's, the Morgan based Duron's have internal diodes built into the processor so temperatures can be taken directly from the core instead of an external source. While motherboard manufacturers are slow to adopt this technology it obviously has great potential in stopping all those heat related CPU deaths we hear about. Since this Duron 1 GHz processor has the same stepping as the 1.3 GHz Duron (AXIA all over again!) we were pretty sure the chip will do at least 1.3 GHz - pretty good for a $90 processor. True to form the little Duron did not disappoint us! We unlocked the processor with a simple pencil by connecting the L1 bridges and found that the 10x multiplier is very easy to work with, so we left that at default. The highest we were able to push this chip was 1440 MHz with a voltage of 1.85V. Not too shabby for our dirt cheap processor!